My Docs Online FAQ » How can I set Folder Permissions in a My Docs Online Account? How can I set Folder Permissions in a My Docs Online Account? Folder permissions may be set by the Group Administrator. To set folder permissions, log into your account at www.mydocsonline.com, then click the “Group Administration” button, then select the tab for “Folder Permissions”. 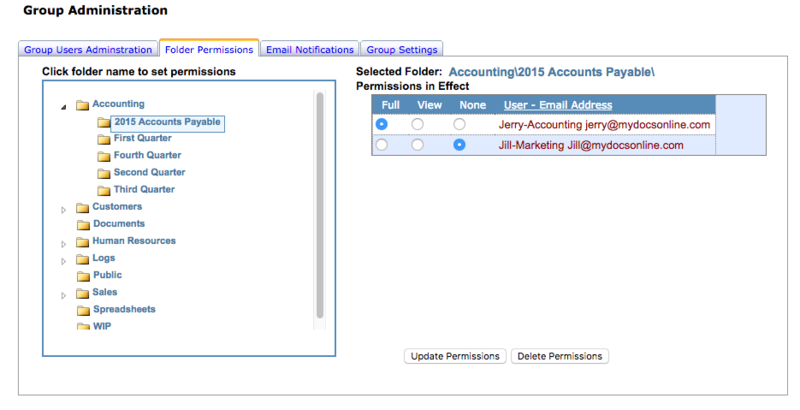 To add or update permissions on a folder just select the folder and your user list will appear. From this point you select who you want to “View” only, or have “Full Control” or have “No Access” at all to this folder, for each of your members, and click “Update”. Here’s a short video that walks through the process of setting permissions for an account.